Great work and a strong portfolio only showcase some of what a digital marketing agency can do. People and processes are the secret sauce that separates a good agency from a great one. How do you find an agency that approaches marketing from a strategic perspective? By asking pointed questions and knowing what a good answer looks like. The rest — like whether or not you actually want to work with these people — has to come from your gut. Don’t be afraid to trust yourself, but first, start with these questions. What is the onboarding process like? The beginnings of a relationship are important for learning about each other, setting goals, understanding expectations, and establishing a plan. A strong digital marketing agency already has procedures in place to make this happen. They should be confident in sharing what will happen each step of the way, and you should be excited to begin. Want to know what a good kickoff meeting looks like? Here’s what goes into planning a project kickoff that starts your relationship with a powerful foundation for marketing. Are you a full-service agency? The more capabilities your digital marketing agency has the better. Ask your agency if they have design, development, copywriting, and marketing teams in-house or whether they outsource the work. Most agencies will outsource at least some extra work (like writing blogs or social media, for example) but it’s easier to work with an agency that keeps most of the projects entirely in-house. This way, you develop a relationship with your team and they understand your goals and brand identity. A successful project begins with solid goals. Ask your digital marketing agency how they plan to define and measure success throughout the project. The most important thing is that you are both on the same page and are striving for the same outcome. Typically, an agency will want to set SMART goals, which means Specific, Measurable, Assignable, Relevant, and Time-Based. Here’s a little more on what goes into setting marketing goals. What is the timeline for my project, and when can I expect to see success? We know you’re excited, but a good marketing strategy takes time to create, and, depending on what you’ve done in the past, it can take up to six months to see results. Having an idea of what will happen — and when — can ease impatience and create understanding between you and your agency. Ask to see a timeline (they should be able to provide an estimated timeline, at minimum) but understand that timelines are variable and no one can give you an absolute answer on how many leads you’ll get and exactly when. How do you deal with unknowns? Even when everything is clearly laid out in a contract or marketing strategy, unknowns are bound to pop up. The best agencies have a plan in place for the unplanned. Big Sea has adopted the Agile methodology, which allows us to respond to change quickly and adapt our schedule. 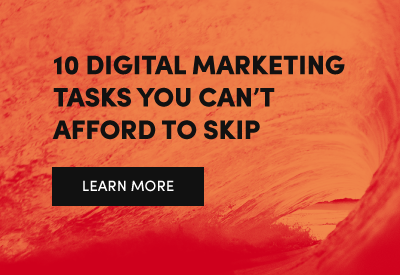 Your digital marketing agency should be able to do that, too. Embrace unknowns as opportunities to grow and pivot when necessary. But if you feel like the unknowns are about who you are and what you want to achieve, there may be an issue. How often will we meet about the project? When will I receive updates? This is another question that helps set expectations. Every project is different, and when and how you meet with your marketing team will change throughout the project. Do you want to be involved every step of the way, with a quick touch base phone call each week? Or do you prefer to only hear from your team when milestones are hit? Discuss this with your agency so you can both get a feel for what the other prefers. Red flags here might look a game plan that doesn’t involve you often enough. A great agency doesn’t expect you to do the work, but will expect you to approve collateral and plans and share your ongoing goals. A great agency will flesh out deliverables based on discovery, and those deliverables could change as tactics shift and your agency determines what gets you results. What is included in my contract? Most projects and retainers are built within an estimated budget that includes agreed upon assets and services. It’s important that you and your agency are both clear on what is expected within this. Do you know if your contract includes website maintenance? Social media monitoring? Will your team produce paid ads or include traditional media in their plan? These are questions you need to ask and discuss. Don’t be surprised if there are some unknowns at this stage. A great agency will flesh out deliverables based on discovery, and those deliverables could change as tactics shift and your agency determines what gets you results. Do you understand my industry? If your agency has never worked in your industry before, ask what they’ll be doing to get up to speed on the language and atmosphere of the work you do. A great agency will not only dig into your buyer personas, but will also research what the business landscape looks like. Don’t be afraid to work with an agency who has served or still serves clients just like you. As long as they’re not working with a direct local competitor, chances are that experience will only get your marketing strategy up and running more quickly, with greater insight driving the tactics. Pay attention to how your questions are received. Is the agency happy to field them? Do they have plenty of questions for you in return? That kind of back and forth signals a true partnership, not an order-taking relationship. And that’s what you want if you’re looking to make an impact with your digital marketing strategy.